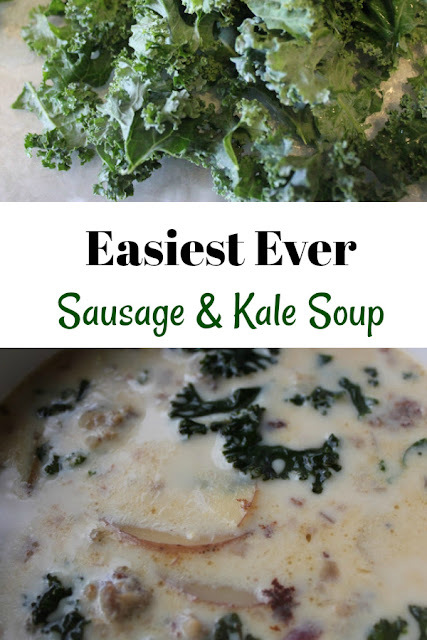 I have seen so many yummy recipes for kale and sausage soup; since my husband took the plunge to buy kale from our supermarket for the first time ever, I thought it would be a good way to use up a little-known ingredient. I took an original recipe from The Pioneer Woman and adapted it with what I had on hand. It turned out pretty well, and was much lighter than similar recipes that call for heavy cream and broth. 1. To begin, prepare your ingredients. Wash and tear up the kale into bite sized pieces. Slice the red potatoes -- very thin. 2. Squeeze the sausage from the casings and brown in a pan over medium-high heat. You may have to add a bit of olive oil, if the meat starts sticking. 4. Add in the potatoes and kale. Cook over medium heat until the potatoes are tender -- or about 15 minutes. Stir, as needed, being sure not to break up the potatoes too much. Do you have any special way to cook kale? We really enjoyed this delicious sausage and kale soup, and we look forward to trying this unique ingredient in other dishes soon!